Isaac Wilson met Anthony Pacheco at a house show where Anthony was performing. After an incident where his instrument was thrown to the ground and his body into a pool, Isaac had to out and ask if Anthony would like to join his band, Dwellings. The duo has been stirring up a graceful maelstrom bending the foundations of progressive rock music ever since. 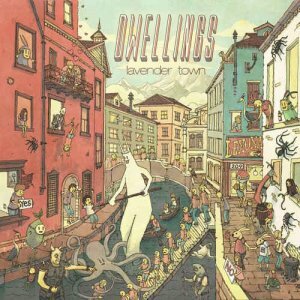 Dwellings achieves their sound by fusing perpetually mutating polyrhythms, lush chords, and smooth melodies. Though their songs are dense and virtuosic, they have a childlike playfulness that lies underneath; imagine an olympic gold medal swimmer enchanted by dancing bubbles. However, there are sharks in the water, and sometimes they’re drawn to the surface by an aggressive riff or a guttural vocal. Moments like these never overstay their welcome. If there’s one message Dwellings wants to spread, it’s that no obstacle is worth sacrificing your happiness; the best way to overcome something is by moving forward and having a bit of fun while you’re at it. On May 11th 2018, the band announced signing to Tragic Hero Records for the long-awaited release of their debut full-length album “Lavender Town.” The album will be released on June 29th 2018.